Were Cats Destined to Become Pets? The rise of human civilization was destined to give rise to the housecat. That’s one startling implication of a study published this week in Proceedings of the National Academy of Sciences. Eight feline bones found in an ancient Chinese village suggest that the advent of farming—the foundation of human civilization—was bound to attract wildcats, which would ultimately self-domesticate and become the world’s most popular pet. The new study, which I covered for Science, concerns a 5,000-year-old village known as Quanhucun in central China. The people who lived there were early, but successful, millet farmers—and they had a pest problem. A team of archaeologists unearthed rodent burrows tunneled into grain storage pits and v-shaped ceramic vessels the size of giant flower vases, likely designed to keep stored grain out of the mouths of scavengers. To combat these invaders, the villagers appear to have turned to cats. The feline bones the researchers discovered at the site all contain specific signatures of carbon and nitrogen that suggest the cats ate grain-eating rodents. In return, the villagers appear to have cared for the cats. A feline jawbone found at the site has significant wear on its teeth, indicating that it may have lived six or more years—quite elderly for the time. And that, in turn, suggests that someone was looking after it. The analysis of a bone belonging to a different cat indicates that the animal ate human food, another clue that these felines had become pets. This isn’t the earliest example of cat-human cohabitation. That honor belongs to the 9,500-year-old remains of a cat found buried with a human on the Mediterranean island of Cyprus. The remains were discovered in the ruins of Shillourokambos, a very early farming village, and the feline was a descendant of the Near Eastern wildcat—the ancestor of today’s housecat. Based on this and other finds, researchers have long speculated that the following sequence of events led to the domestication of the cat: farming attracted rodents, rodents attracted wildcats, and wildcats became cats when villagers started caring for these pest-killing felines. The Quanhucun study provides the first hard evidence for this theory. I think the work hints at something even more remarkable, however: cats were destined to become our pets. The idea has to do with the species of feline found at Quanhucun. That’s still an open question, but there are a couple of possibilities. One is that, like the Cyprus cat, the Quanhucun cats were domesticated or semi-domesticated descendants of the Near Eastern wildcat, and that they somehow made their way to China from the Mediterranean and surrounding regions, possibly via ancient trade routes. If so, the story of Quanhucun is less interesting, as the villagers would have played little role in the domestication of the cat. 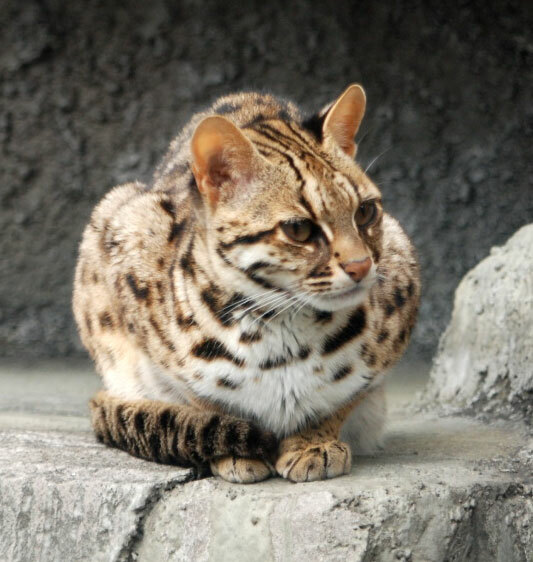 But it’s also possible that the Quanhucun cats were descendants of a different species of small feline, perhaps jungle cats or leopard cats, which are native to the area. If that’s the case, the villagers may have domesticated a new species of cat—though these animals would have eventually died out, as no trace of their unique DNA is present in today’s housecat. And here’s the kicker: If cats were independently domesticated in both China and the Near East, it’s possible they were domesticated in other parts of the world as well. Any region that had both farming and a local species of wildcat could have given rise to domestic cats. The process was so natural, it was bound to happen. And because farming is the lynchpin of human civilization, human civilization was destined to give rise to the housecat. Cats, it seems, were fated to be our pets. Chinese biologists and cat fanciers have long insisted that the Dragon Li breed was self-domesticated from F bieti (now recognised as a subspecies of F lybica). Mongrelisation with cats of Egyptian origin would have begun as cats moved along trade routes. Thanks for your comment Sarah! My understanding is that bieti is a subspecies of F. sylvestris. Interesting about the trade routes.